Today we are in a world of many prescription drugs and medicines, tons of various tests, procedures and never ending lists of things that can make us sick. It is important to have alternate ways to keep yourself healthy. Many of the medicines we take now found their start as a natural remedy for whatever it is they are treating. You can still use natural remedies to help with common ailments. Garlic – Garlic has a ton of beneficial aspects to it besides as a seasoning for food. 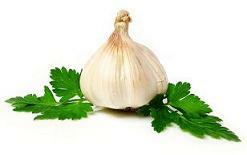 Garlic has been known to help with asthma, diabetes, athlete’s foot, high cholesterol and bacterial infections. Garlic can be taken as a pill, powder, and oil or by using the clove itself. Basil – Used a lot cooking, basil belongs to the mint family of herbs. Basil can be used as an antiseptic; it can help with inflammation, high blood sugar, pain relief and also as a way to help treat stomach ulcers. Normally the powdered version is added to hot water, just like tea and drank twice a day. Aloe – Everyone has heard of aloe and how it can help soften your skin but did you know that aloe has been used in its natural form for many centuries? The plant itself can be purchased and kept in your house and whenever you need some aloe, you just break a piece and squeeze it out. You don’t get much more natural than that. Aloe is good for skin irritations, burn treatment and other minor wounds. Capsicum – Capsicum is probably most well known for it’s use in pepper sprays however, it has been used long before that in making your food spicy and giving it some serious heat. It is also medicinal in nature. People have used capsicum to help with pain relief, skin irritation, urinary problems and chronic laryngitis. It normally comes in a gel, spray or lotion. Cinnamon – This fragrant spice has been used to help people treat problems for a long, long time. Cinnamon comes as pieces of dried bark, in a powder, as dried leaves or in oil form. It has been used to help treat abdominal pain, chest pain, kidney problems, blood sugar issues and the common cold. The only problem with cinnamon is experts don’t agree on what dosage to take to make it beneficial. Chamomile – Yes, as in chamomile tea as that is the most widely known form. You can also get chamomile in a capsule form or as a liquid, aside from tea that is. Chamomile has been known to help with migraines, stomach disorders, throat discomfort, eye irritations and skin blisters. Eucalyptus – You’ve probably heard of this mainly in it’s oil state and when used to help unclog a stuffy nose. This is the most popular use for eucalyptus but it is also known to help treat asthma and coughs as well. Normally you would use the oil to help with these symptoms. Many of these items can be found in your local grocery store or you may even have them already in your cupboard. So next time you find yourself reaching for the bottle of pills try one of these natural ways first.